In a city of street performers fighting tooth and nail for any sort of audible reaction from audience members, it seems strange for a performer to ask you to be silent. Silence, or more specifically walking in silence, is a common theme shared by a pair of productions at the Edinburgh Art Festival and Edinburgh Festival Fringe, offering audience participants a refreshing meditative experience amid Edinburgh’s buzzing festival atmosphere. We joined Deveron Arts this past Friday, 1 August, for their Urbanscape + Ruralsprawl performance and discussion. The day was full with activity, being led by artists Tim Knowles and Ania Bas for walks in, around, up and down the sprawling corridors of Summerhall. To thematically complement our time with Deveron Arts, we also attended A Walk at the Edge of the World, a production by Magnetic North featuring actor Ian Cameron. The performance involved a silent walk along the Water of Leith, both beginning and ending at the Scottish National Gallery of Modern Art, followed by Cameron’s performance, narrating a collection of anecdotes inspired by walks. It is difficult to reflect on these events without tracing the history of walking within the contemporary arts, as important precedents have paved a metaphoric path for these more recent explorations. The artist and the walk is a methodology often explored and easily implemented, valuable to an artist’s singular practice but also more collaborative social practices. Often thought to be the contemporary innovators of walking as an artistic practice, the Situationists were a group of artists and intellectuals active from the late 1950’s to early 1970’s. Inspired by Dada, Surrealism and Lettrism the group owes much of its leadership to Guy Debord (a French Marxist theorist, writer and filmmaker). The Situationists embraced the idea of the dérive– a directionless wander through the context of a landscape, most often a city landscape, with the intention of inciting a particular emotion or behaviour from the participant. With their strong political ties to Marxism, these walks also became an opportunity to react to the capitalist-driven rhythm of the contemporary industrialised city. British land artist Richard Long is also indubitably relevant to the artistic practice of walking. Known for his “epic walks, sometimes lasting many days, to remote parts of the world,” Long’s creations embody his action through and within a landscape, turning over conventions of landscape representation by more conventional means. Falling somewhere between a meditation and an intervention, Long’s works are well recognised across the international art network. Our time with Deveron Arts was split between a complete immersion of action through the context of Summerhall and more thoughtful provocations that arose from the afternoon’s seminar. The morning began with participatory performances by Ania Bas and Tim Knowles. Bas, co-founder of The Walking Reading Group on Participation, led us through Summerhall on the same route multiple times, altering the experience each time by asking participants to walk in pairs and either speak, remain silent or allow their partner to guide them as they walked with their eyes closed along the corridors. Knowles’ approach to participation involved a fast-paced jolt through Summerhall, using a communication technique similar to a game of Chinese whispers. After the active-rich morning, the group reconvened at the Creative Scotland headquarters, to hear from artist/poet Alec Finlay and artist Gill Russell, along with Ania Bas and Tim Knowles, with artist/writer/curator Dave Beech. Bas elaborated on her use of walking as methodology for communication and social behaviour, as she uses the techniques implemented earlier in the day at Summerhall with her walking reading group to provoke conversation and allowing for equal participation amongst all members. Knowles’ projects bring both urban and rural applications of walking to his practice. Playing with concepts of being taken ‘wherever the wind leads you,’ or the translation of an immersive forest walk for a gallery context, Knowles’ work often brings a new context to participatory practice. Shortly after attending Deveron Art’s Urbanscape + Ruralsprawl event and symposium we found ourselves “walk(ing) at the edge of the world” with performer Ian Cameron from Magnetic North. 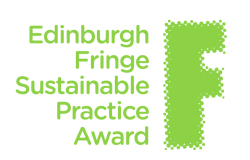 A Walk at the Edge of the World is a contender for the Edinburgh Fringe Sustainable Practice Award, due to its thematic links to sustainability and the low material impact of the production. 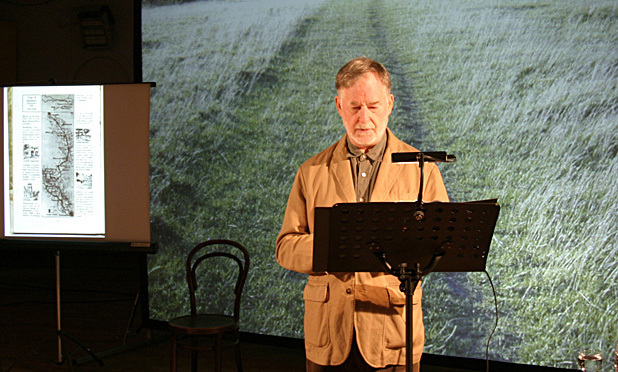 The performance began with Ian Cameron requesting we remain silent during the entirety of a twenty-minute walk along the Water of Leith. As Summerhall hosted the event at the Scottish National Gallery of Modern Art, the location of this walk provided a beautiful stretch of the city’s major waterway. While Cameron’s performances usually take place in more rural settings, the refuge of this hidden bit of the city provided a powerful immersive contrast for those who attended. After a meditative walk, we were brought into a theatre to listen to Cameron’s monologue. Cameron explained his history of walking, citing a key instance of when he began walking freely, rather than adhering to a path prescribed by a guidebook. In this instance, he had been following a trail, out of a rather old guidebook he noted, that was abruptly interrupted by a motorway perpendicular to the path. After relying on the guidebook’s prescribed trails for a number of walks, Cameron’s mind was sent into a flurry- what does he do now, where does he go from here? Resolutely, he began following the motorway, quickly losing any sense of a trail, and thus realised that walking freely gave a sense of elation and infinite possibility. What emerged from these performances and discussions is the idea that walking can be a convenient tool for contextual artworks. Using and working within the context that is already existing can be more effective than a permanent creation that simply responds to a remote context. An interesting provocation mentioned at the Urbanscape + Ruralsprawl discussion was the acknowledgment of the tension between capturing a moment permanently and the ephemeral act of walking. Aside from the aforementioned ideologies that are aligned with this mode of practice, the performances we recently viewed and discussed are extremely lo-fi in their production materials; rather than imposing a set and props on a location, the context is the set and the participants are the props and actors. The low material impact of these pieces on their respective contexts allows a more authentic experience, as well as a more environmentally sustainable one. Whether a healthy pastime or a means to ‘jiggle thinking’ (in the words of Alec Finlay), walking as an artistic practice can reflect past environmental and social conditions and can also readapt itself infinitely to contemporary contexts. Urbanscape + Ruralsprawl was a one-off event on 1 August 2014 organised by Deveron Arts in collaboration with the Edinburgh Art Festival. A Walk at the Edge of the World runs 6, 8, 10, 12-17, 19-24 August 2014 from 17.00-18.10 as part of the Edinburgh Festival Fringe. 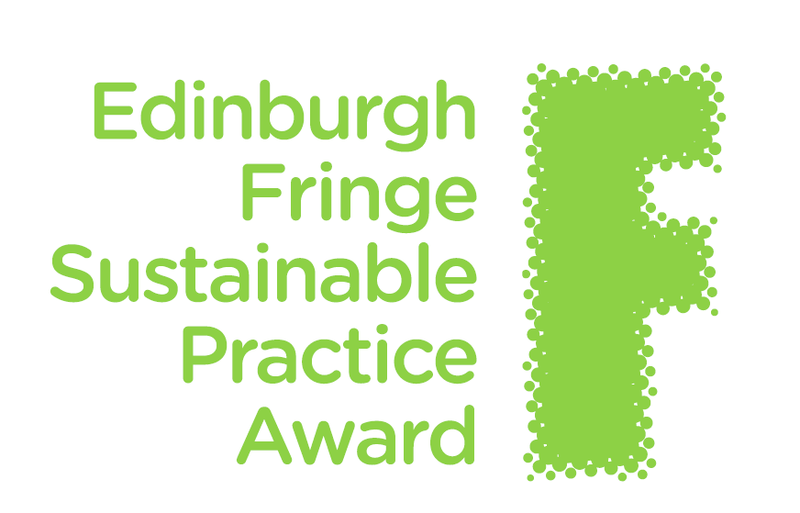 The post #GreenFests: Taking a Walk appeared first on Creative Carbon Scotland.